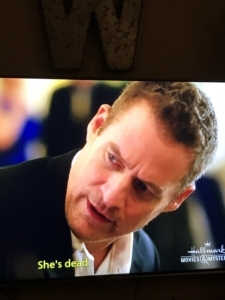 My love for Hallmark movies and also Hallmark mysteries is deep and abiding. 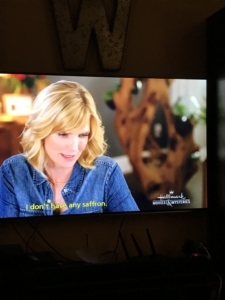 One of my favorite things to do is put my jammies on, get all fixed on the couch with at least one and maybe three dogs and, if I’m lucky, my husband and/or one of my kids, and watch a seasonally appropriate Hallmark movie or a new Hallmark mystery series. My daughter, Blair, is my long-distance Hallmark movie partner, so my even more favorite thing to do is text her while we’re both watching one of these movies together, although in different states. I also like to pause the movie and take screen shots with my phone – which I always have nearby so I can go on the Internet Movie Database (IMDB) website for reference when I want to look up a cast member. The movie this time was the latest installment in the Emma Fielding mystery series: “More Bitter Than Death.” That’s a quote from Ecclesiastes 7:26. “And I find more bitter than death the woman, whose heart is snares and nets, and her hands as bands: whoso pleaseth God shall escape from her; but the sinner shall be taken by her.” Study this. Ponder it, and – just kidding! The passage itself actually sheds no light whatsoever! However (no spoilers here, don’t worry) a clue from this passage does lead our astute heroine, Emma Fielding, to identify and confront the killer. Also: nifty title for a movie! In this movie – very important – we see Emma and FBI agent Jim Conner finally admit they like each other. (Jim Conner, by the way, is played by the excellent James Tupper, who was so good in “Love’s Long Journey,” a favorite Hallmark movie from 2005, as Henry, the bereaved, disillusioned-but-deep-down-a-good-man-who-really-does-still-believe-in-God, ranch hand). So, he’s great. 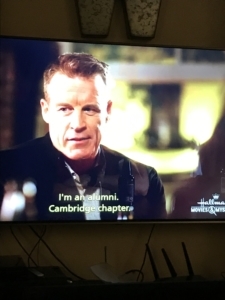 We also meet someone from Emma’s past – Duncan Thatcher (played by Mark Valley, aka Brad Chase from “Boston Legal”) a handsome archeology professor from Cambridge, whom Emma describes as “perfect.” She should know; they used to be an item. People, my mother was an English teacher and my father is a retired journalism professor. I can’t help myself; it’s in my DNA. This makes my flesh crawl. 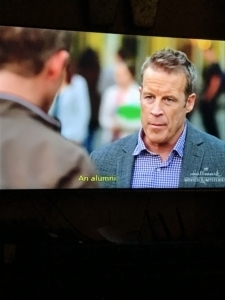 Later, we hear an unfortunate grammatical error from the Dean of the College, or maybe even the whole university, I’m a little fuzzy on this point, because I was on IMDB, trying to look him up. Alas, once again, IMDB has failed me, and I can’t give you the actor’s name. I have noticed this odd phenomenon when I have been trying to look up actors in a Hallmark movie: it’s hard to get a list of the entire cast. 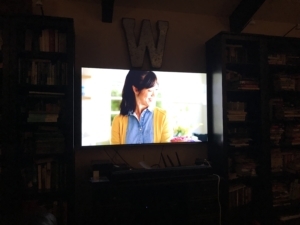 I can’t imagine why this occurs, but it has happened to me with Hallmark movies numerous times. 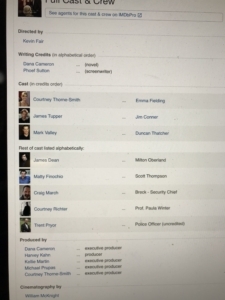 IMDB just has a partial cast list (see my picture of it). So I don’t know who this actor is, and although I’ve seen him before, I can’t recall which movies. It’s bothering me. I didn’t mean to get so sidetracked, but that’s just the way it is with the IMDB/Hallmark rabbit hole. Now we come to the murder. The victim – again, not listed on the IMDB cast list – looked familiar. I thought she resembled Margot Kidder – who was, of course, the best Lois Lane ever in the best Superman movie ever, opposite the best Superman ever, Christopher Reeve. So I looked on IMDB, and sure enough, there she was: Janet Kidder. Margot’s niece! Isn’t that nice! She has been in a few other Hallmark movies, and of course, she’s Canadian, so she’s doubly Hallmark-appropriate. Basically, at a fancy dinner meeting, Janet Kidder gets up to a podium and keels over. Now, this brings me to another very important issue I have with Hallmark murder movies: Why do they not even try CPR? Come on, how about a chest compression? Just try it! Check the airway! Maybe she choked on a biscuit, or something, not that they had a biscuit at this fancy dinner, but still, she could have tucked one away, eaten it furtively and then choked on it! What could it hurt to check for a biscuit? It’s always so nice to see Crystal Balint – Canadian, of course – although she also didn’t make the IMDB cast list (see above). She’s a versatile actress and has been in a bunch of Hallmark movies, and she saved the day as a seamstress in “Royal New Year’s Eve,” for Jessy Shram’s Cinderella-like character. Just a shout-out to one of my many favorites in the Hallmark family. Interestingly, as I was trying to take her picture, I captured two of Emma instead. Apparently, there was quite the discussion of saffron as an ingredient. There were several suspects, but I just want to commend Professor Braverman for his ability to scamper like a hamster in a totally unexpected chase scene with Jim Connor and, at the end, Duncan Thatcher joining in. 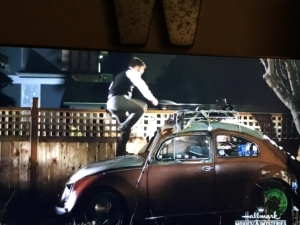 Running up a VW Bug, jumping over fences. Just a nimble and speedy guy! 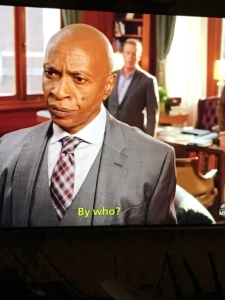 I’ve seen him before, but who is the actor? I have no idea – because, again, he didn’t make the partial cast list. Thanks for nothing (again), IMDB! 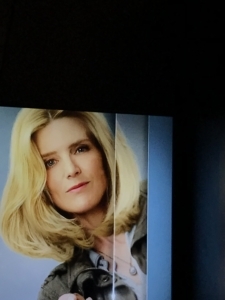 Note to Emma Fielding producers: The picture of Emma Fielding on the promo for the series looks a lot different from Emma today. They are both beautiful pictures, but let’s make the effort to keep it current. As to the commercials themselves: I make my living writing about medical problems. My husband is a doctor. Our families have had their share of serious medical conditions. I’m no stranger to illness. 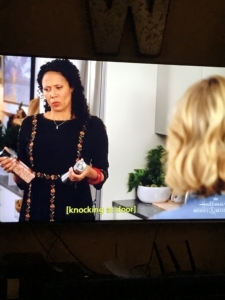 But for the love of God, are there no healthy people who watch Hallmark? Walgreens, particularly people on Medicare Part D.
The Hurry Cane, although I like that one, because the one scrappy guy with the better cane gets the girl. This happy disposable undies lady (this photo I actually took from a magazine, but it’s the same lady). Medicine for metastatic breast cancer. A terrifying one about a poor man with Parkinson’s disease who is suffering from hallucinations. He sees multiple Chocolate Labs, so I guess if I had to hallucinate, I’d rather see Labs than monsters, but still. 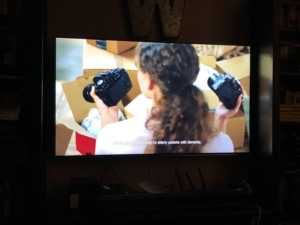 This commercial (see photo) for bipolar medicine, featuring some poor woman who is looking at all her binge purchases, and then when the medicine kicks in, she has a happy interaction with the delivery guy who is taking them for returns. Hallmark, as far as I know, people of all ages like your movies. Some are even in good health! There are some commercials that are not medical. If I had a nickel for every time I’ve seen this one featuring the cute little girls who make “princess toast” for their mom, I’d have several dollars by now. It’s for Nature Made gummy vitamins, but I like the commercial mainly because I like to hear the mom say, “Oh!” in a delighted way. She’s just so happy! Hallmark, put her in a movie! But then there was this one for Reese’s Easter candy. Don’t get me wrong: I love Reese’s Cups. But this commercial makes me feel uncomfortable. A chocolate bunny makes its way toward a jar of peanut butter, and suddenly we hear Marvin Gaye singing, “Let’s Get It On.” Ew! No! I don’t want that! The result: Two great tastes that go great together. That was genius! That was classic! 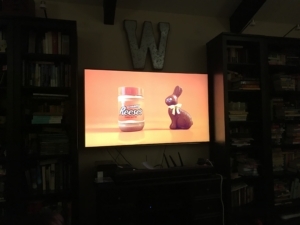 Not a cringe-worthy, creepy, weird chocolate bunny sidling up to the peanut butter jar. Also, I don’t want that bunny near my kids. Hallmark Movies: Props for the Prop!